In the hospitality and events industry, every time an event needs to be planned, an event order form needs to be mapped out with the precise and relevant details of the event. There are all kinds of different minor and major responsibilities which need to be fulfilled in the planning of an event. In order to make sure no gaps or errors happen, all the event’s specifics are spelled out in a systematic manner in an Event Forms. An event planning order form lists out the selections of food, beverages, and other essential items which the client has agreed upon. A form of this type is basically an agreement validating the fact that the order for an event to be organized and managed by a particular company has actually be approved and placed. 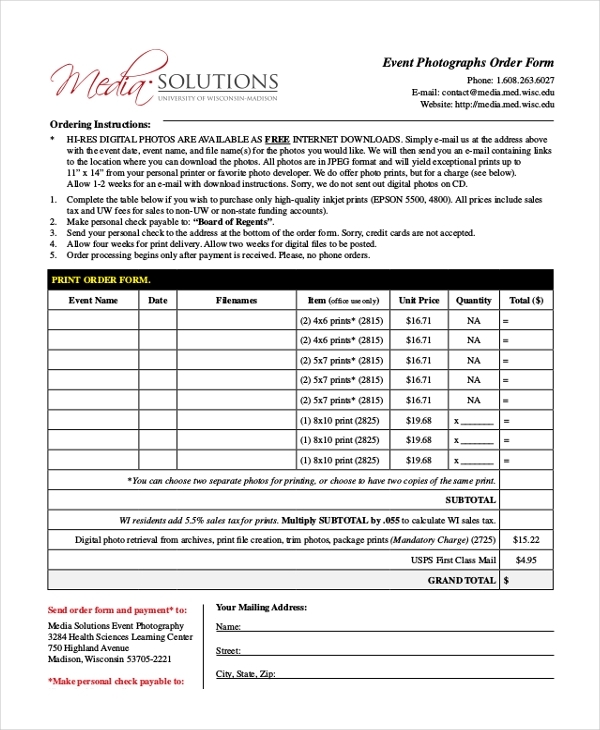 An event photography order form is used by photographers to fill in the details of the client’s photography requirements for a particular event. The form lists the various types of pictures, sizes, quantity, and price and total price. Such an order form is kind of an agreement which is stipulated between the client and the photography studio or company which has been signed for capturing the event. 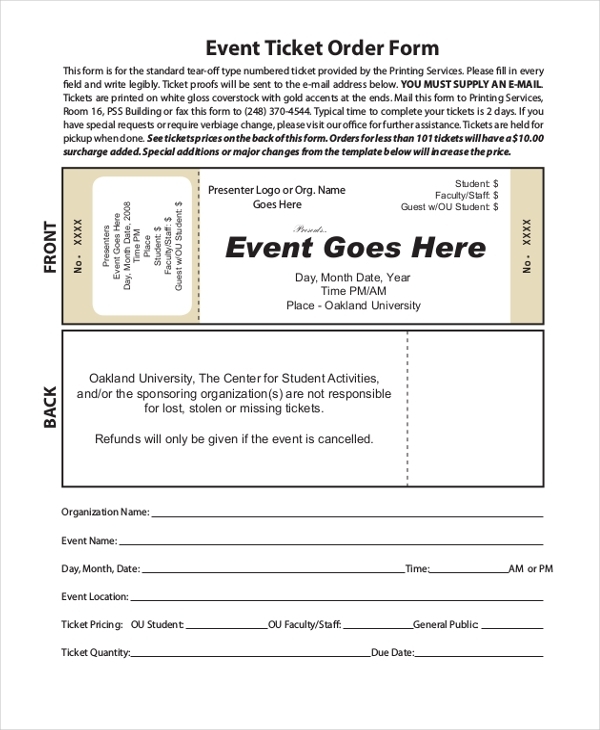 An event ticket order form is usually used by event organizers when there are event tickets needed to be designed and generated. An event ticket order form must have details such as contact information, event & ticket information, delivery method and method of payment. 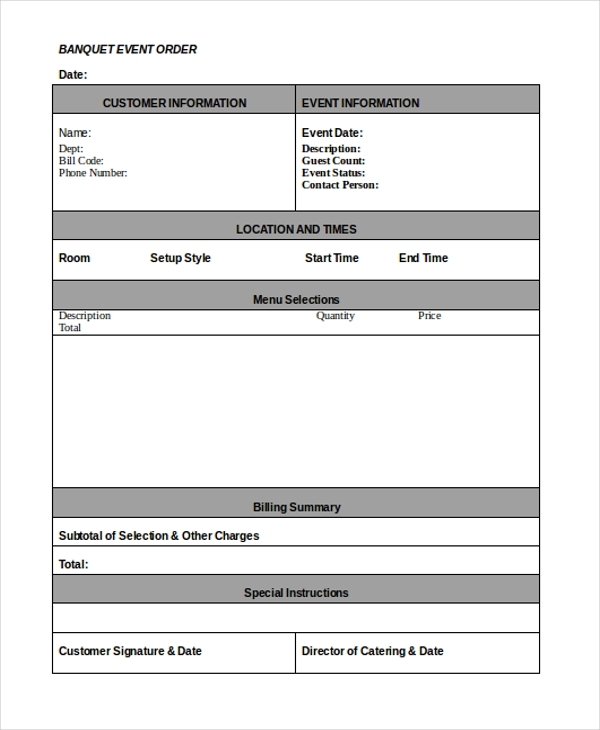 An event banquet form is an agreement form wherein all the choices and specification with regards to different aspects like food and beverage, audio/visual, room setup(s), staffing requirements and other event needs, including venue details, are all spelled out and the payments associated are mentioned. Such a form is usually prepared by the event manager or venue coordinator who is given the responsibility to oversee the event. It is a checklist document wherein all the food and beverage items are lined up in columns corresponding to each item the respective quantity, preload check and load truck check. 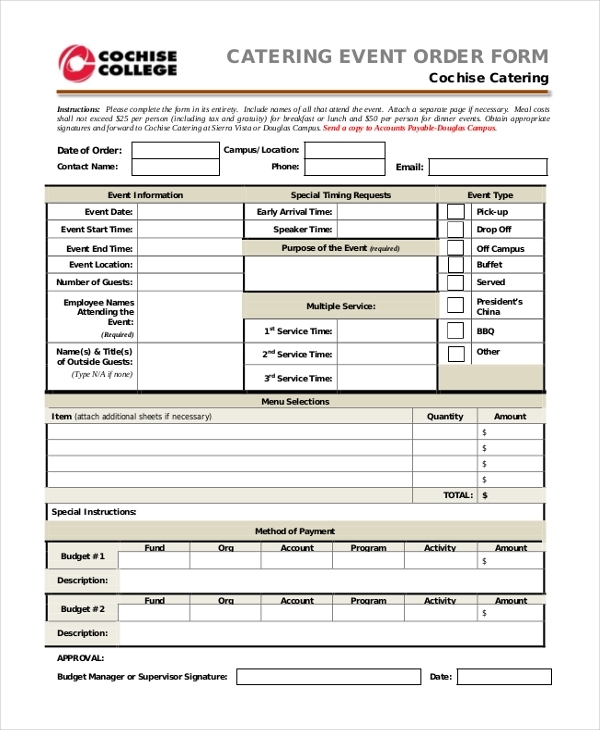 This form is prepared and populated by the catering company assigned to do catering for an event. 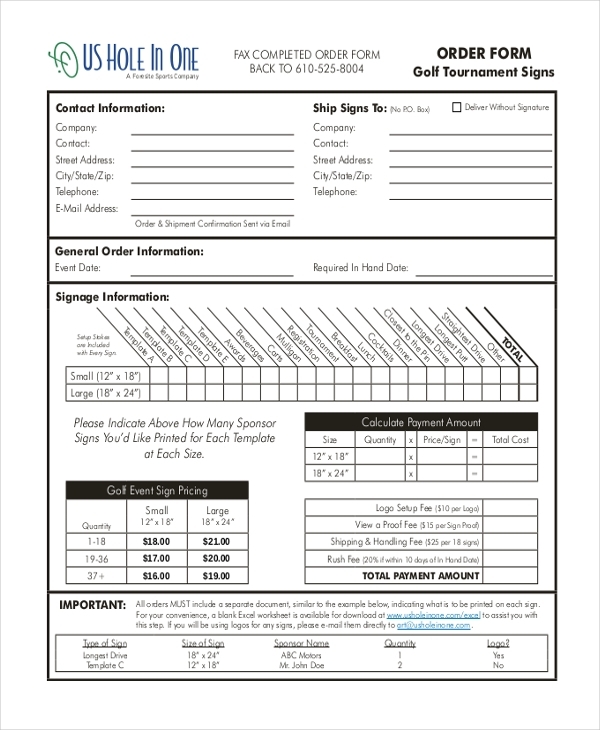 As it is obvious a golf event order form is a must-use for organizing orderly and successful golf events. The form lists out the various fields wherein the specifics wanted for a golf event need to be populated in a precise and accurate manner. 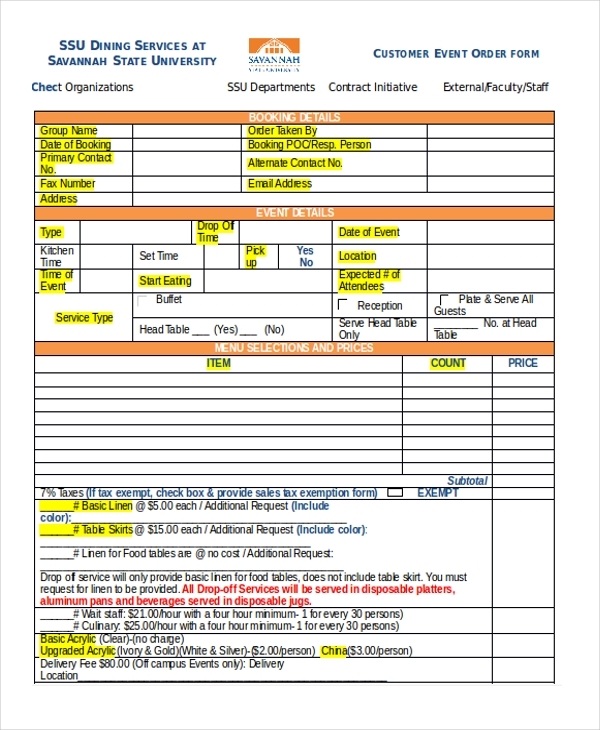 An event work order form is similar to any other order form. The prerequisites required for organizing an event need to be spelled out accurately – including the venue details and number of people expected to be in attendance and the kind of table and chair arrangement that needs to be done. Specifications pertaining to support and safety, and technical needs must also be populated in the form. A customer event order form is used by clients and customers to specify the services and goods which they require for organizing a particular event. Client or customer details need to be mentioned correctly as well venue specifics need to be given, including date and time of the event. In case an event planner or organizer is hosting a special event at a private venue, they will have to provide the intent for organizing the event as well as other details – such as date, time, participants/attendance, event description activities, security, safety, vendors etc. A wedding may be a timid or extravagant affair. Regardless of its scale, if the guest-list is tall and there is lots of fanfare going to be involved, it can be said that an event is in the works. 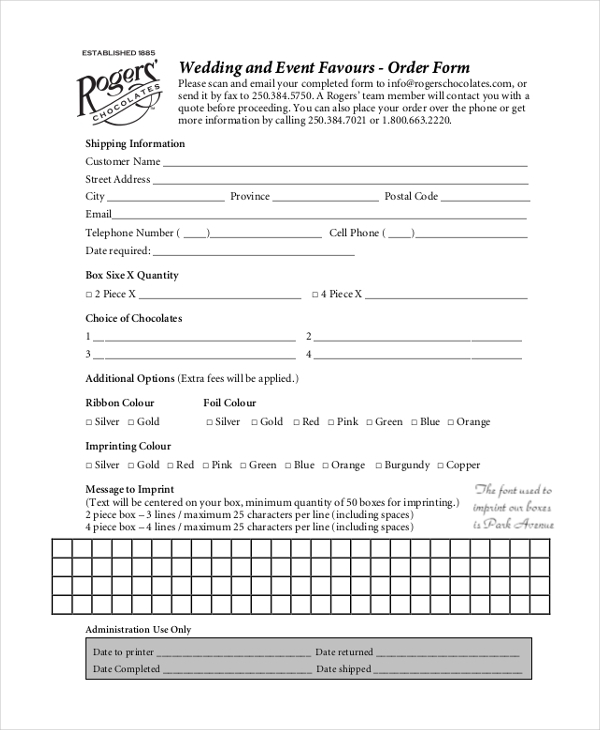 Event managers organizing the wedding event need to have all the specifics provided in written and that’s exactly why a wedding event order form is put to good use. Event order forms are beneficial in a number of ways. Firstly, as all the details and specifics exist on paper, there is no room for error because the event planner/organizer has to abide by the written word in the form. 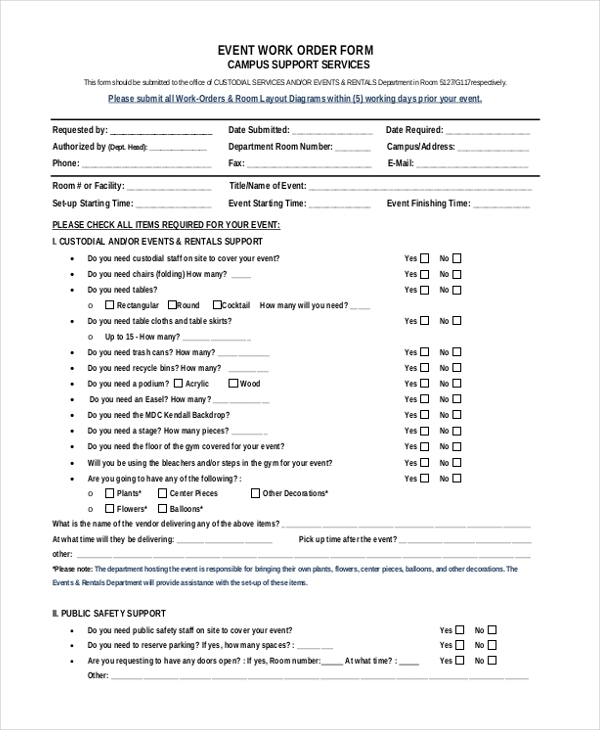 Secondly, as it impossible to keep tabs on all the minor and major details all at once, an event order form not only makes the event official but also helps the planner to have a document that he can go back and cross-check in case there are doubts. You may also see Event Planning Forms. Event order forms are available very easily on the Internet. Most websites offer free downloads. The forms are readymade yet they are customizable. In case you’d like to implement changes in an event order form of your choice, you can download it and edit it its elements in MS Word or Adobe Photoshop. The forms are available in MS Word, PSD, PDF and Excel Formats. 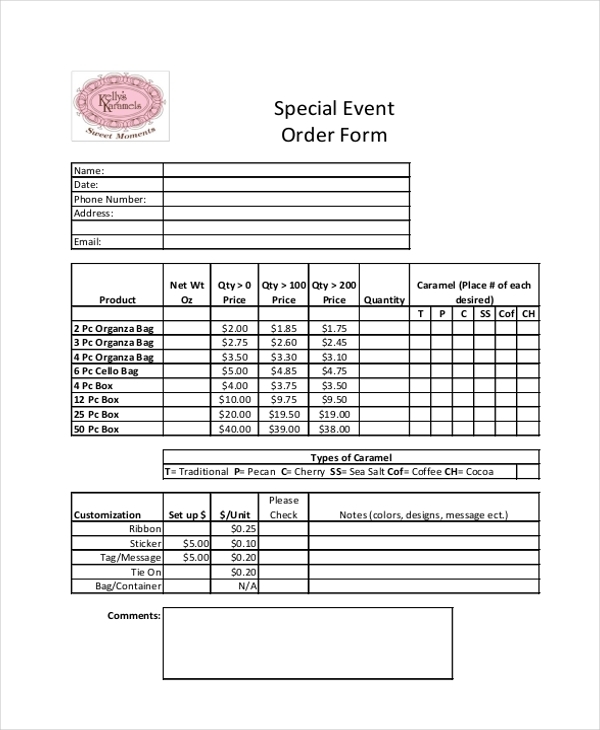 Event Order Forms are useful for event planners, managers, and organizers. The forms can be used for not just noting down the details and all relevant information, the same documents come in handy for record-keeping purposes. In case an event planner wants to replicate ideas from a past event, he can always go back and refer to the event order form which was created for the said event and take suggestions and ideas from the same. You can also see Event Proposal Forms. Event order forms are very important. They help in ensuring that events are overseen and taken care of in a professional and systematic manner. An event order form is not just a plain document, but it is indeed official paperwork with which the event planning and preparation gets initiated.